it has to be a big enough recipe yield leftovers that function as an easy lunch at work the next day. an easy lunch is something my husband and I can eat with one hand/one utensil while continuing to blog work through lunch. we have a word for this type of lunchtime leftovers: Lunchtovers. it has to support our efforts to eat well. lots of veggies, high protein (read: filling), low fat, and no simple carbs. it has to be quick! i don’t have a lot of time on weeknights so i need something that will take less than an hour, start to finish, including prep and cleanup. but you know what? it doesn’t have to be pretty. when you are short on time and cooking in large quantities, looks go out the window sometimes. as the youngest of eight children, i grew up knowing that sometimes food has to be function over form (hello, casserole). and, as long as the flavor is there, that’s ok with me. 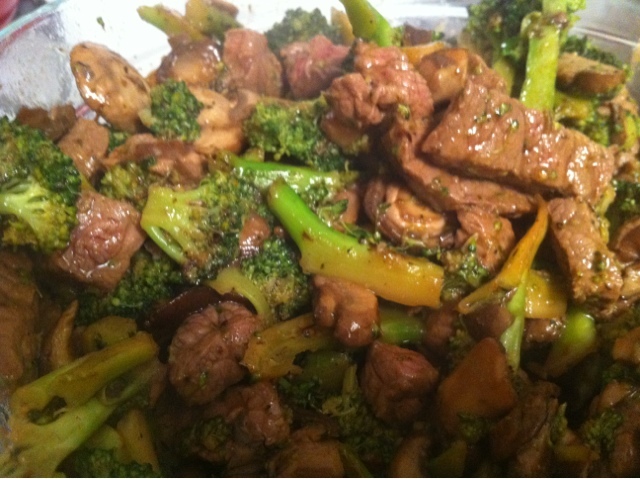 so here is one of my standby midweek workweek lunchtover dinners..
beef and broccoli stir fry. 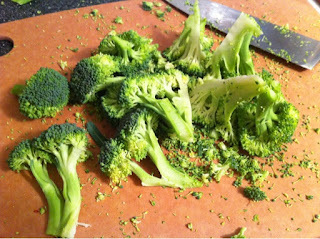 what i LOVE about broccoli: the florets act like little sauce sponges that make every bite moist and flavorful. and i love cooking broccoli (or any green vegetable) on the stove because i love watching it turn from pale vegetable green to vibrant bright spring green... the color of leaves unfurling in april. 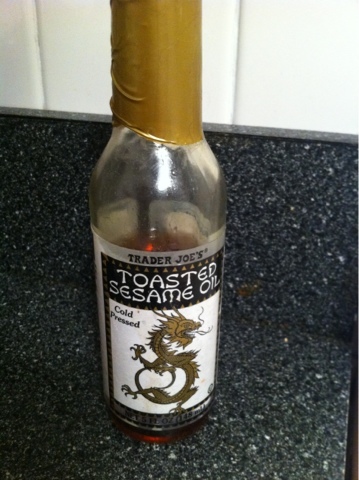 toasted sesame oil: add to all things for delicious flavorful goodness. use sparingly though, because it is a bit expensive. this is one of those ingredients that i find essential to achieve the right flavor in asian dishes. did you know broccoli is in the brassica family? it's cousins include bok choy, brussels sprouts, cabbage, cauliflower, even mustard, rutabaga, and turnip! ooh umami! 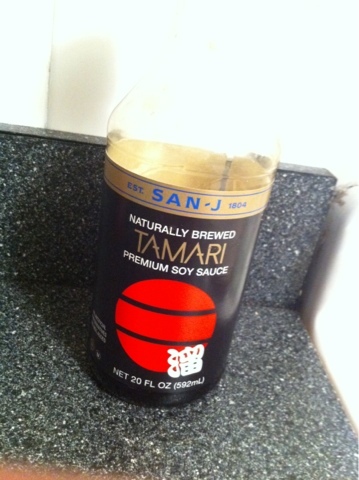 i always buy japanese tamari soy sauce and you should too. it is more viscous, deeper in color, and richer in flavor than regular soy sauce, but not as salty. combine steak strips with all ingredients for marinade in a bowl. stir well to ensure powdered ingredients are well combined. place in refrigerator for about 30 minutes while you prepare the rest of the ingredients. 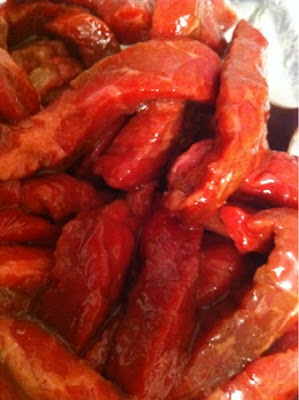 marinating steak. not real photogenic. pour a half tablespoon grapeseed oil in a 12 inch stainless steel skillet. add a splash of toasted sesame oil. heat pan on high until the oil shimmers. toss in can of drained water chestnuts, saute until beginning to brown on one side, give a quick stir to even out browning. remove from heat, set aside. pour a half tablespoon grapeseed oil in a clean 12 inch stainless steel skillet. add a splash of toasted sesame oil. toss in sliced mushrooms, saute until moisture comes out of mushrooms. add a little cracked pepper and continue to sauté until moisture is reduced and mushrooms are tender. remove from heat, set aside. pour 1 tablespoon grapeseed oil in a clean 12 inch stainless steel skillet. add a splash of toasted sesame oil. toss in one of the broccoli portions. 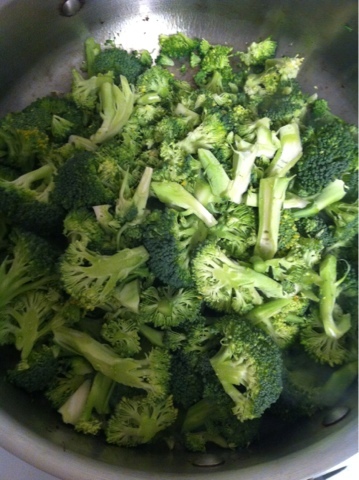 the broccoli will start a pale green color. stir only as needed to ensure even browning. 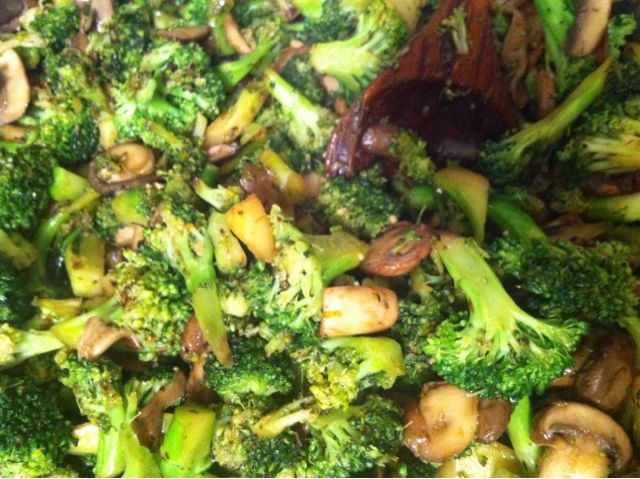 the broccoli is ready when it has turned bright green with bits of browny yummy caramelized bits. remove from heat when it has nearly reached the level of tenderness you prefer in broccoli (standard stir fry calls for a crisp broccoli, but I like mine a bit mushier!) remove from heat, and set aside in a large bowl. look at that bright green color and those lovely browned bits! at this point i wanted to forget the steak, toss this with some lemon juice and fresh parmesan, and call it dinner! clean pan. 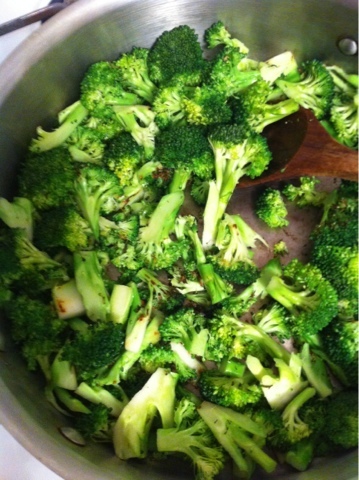 toss in second broccoli portion with the crushed garlic and cook to same consistency. 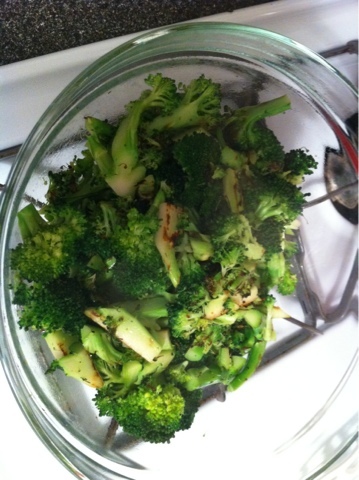 lower heat to medium and add first portion of broccoli and finishing sauce ingredients. stir and cook about one minute until sauce has thickened and broccoli has reached desired level of tenderness. return contents of pan to large bowl. add mushrooms and water chestnuts, and set aside. i love this spoon. it was my mothers, until she gave it to me when i moved into my first apartment. remove steak from refrigerator. put a splash of oil in (cleaned) pan over high flame. when oil is hot, add the steak and heat until cooked but still tender. remove steak from pan with tongs and add to large bowl of vegetables. add a little (or as much as you'd like) of the cooked gravy in skillet to vegetable/steak mixture. stir to combine ingredients, and serve! 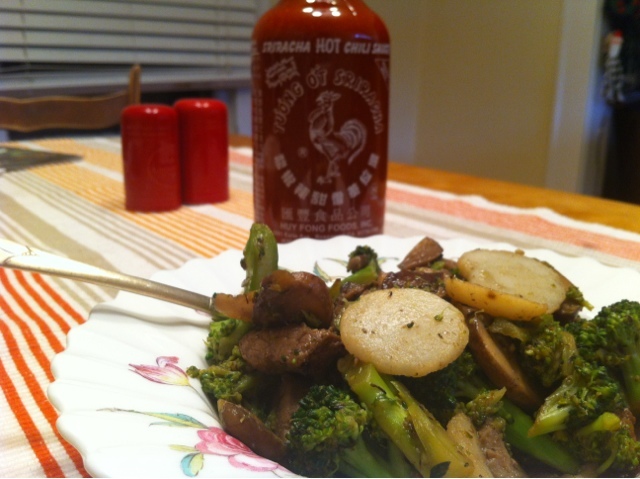 by the way... remember that sriracha i found in the asian foods section last week? tasted GREAT on this!